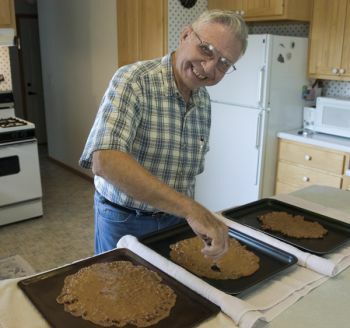 "Women cook 365 days a year; a guy does one thing and look who gets the credit," quipped Marion Kryger, as he made peanut brittle. Arlene Preheim and family gathered in Freeman to create pepper cookies from a cherished family recipe that's over 100 years old. 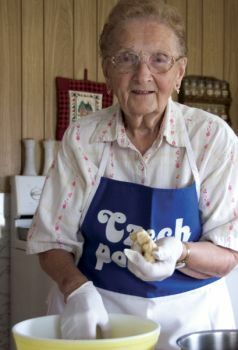 Tillie Varilek of Tyndall sported a apron proclaiming "Czech Power" when she showed us how to make plum dumplings. 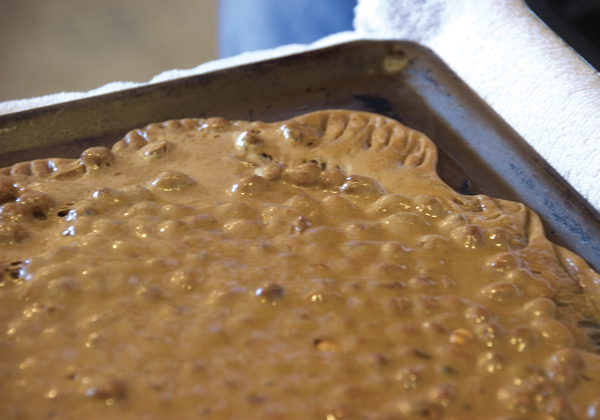 A good peanut brittle is “all in the technique” according to Marion. “First of all, a heavy pan makes all the difference when you’re doing candy,” he says. He also finds the best possible peanuts. He buys from Palmer Candy Company in Sioux City, makers of the Bing bar. Although Marion has never sold his brittle, he donates it to fundraisers for the museum, senior center, historical society and Catholic church in Vermillion. He also makes plates of brittle for donors to his country church, Bergen Lutheran near Meckling. Combine water, syrup, sugar and salt in a heavy pan and bring to full boil. Add peanuts carefully to prevent splatter. Continue cooking on medium heat using a good candy thermometer, stirring occasionally until the mixture reaches 275 degrees. Add butter and vanilla. Stir frequently to prevent burning. Cook to 300 degrees, remove from heat and add soda, stirring quickly and vigorously to distribute evenly and complete foaming action. Pour mixture evenly onto 3 buttered Teflon cookie sheets one at a time using stirring spoon to spread evenly. Use a fork to gently pull the outside edges flat. As brittle begins to cool, lift and gently pull until thin. The spice cookie recipe was given to Arlene by her husband’s mother. She doesn’t know where it originated, but the recipe is more than 100 years old. Both her mother-in-law’s mother and grandmother made the cookies. On a Saturday in early December, family members bring their favorite cookie cutters to Arlene’s home in Freeman to spend the day baking the much-loved cookies. Dough must be rolled out and cut into shapes. 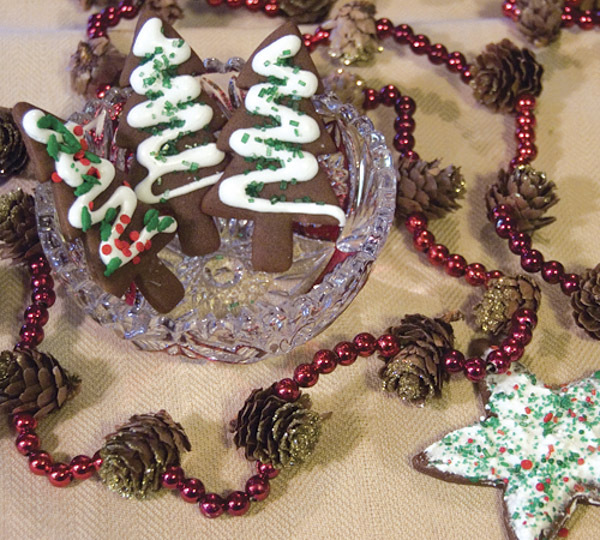 Then, after baking, each cookie is frosted and decorated with colored sugar. An old dining room table in the basement becomes a drying station for the dozens of cookies the recipe produces. For many years, Arlene has kept a cookie count on the back of the recipe card. 2007’s total was 522. The frosting must dry overnight, so the cookies are divided the next day. The division is made carefully so that each container holds the same number of Santas, stars, candy canes, bells, etc. Mix and boil brown sugar, butter, spices and molasses for 5 minutes. Cool slightly and stir in soda. (Be sure to use a large enough cooking pot because when the soda is added it will foam.) When cool, stir in flour to make a stiff dough. Roll dough very thin, cut out and bake at 350 degrees for 8 to 10 minutes. Watch closely, as cookies burn easily. When cool, frost the cookies. Do not use a powdered sugar frosting as the cookies will absorb the moisture and become soft. Try this instead. Boil sugar and water until mixture spins a thread (230 degrees), then beat into egg white. Frosts 80-100 cookies. 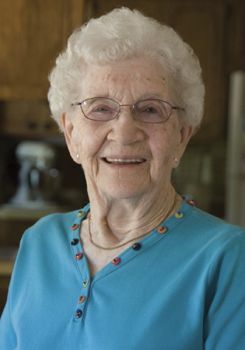 Tillie took her mother’s dumpling recipe with her when she wed, and they were a mandatory dish at family get-togethers and reunions until she passed away in 2012. At one gathering, everyone asked if she’d brought them. “I said, ‘I brought kolaches instead’ and they said “Well, I guess you can stay then,’” Tillie told us in 2008. Work ingredients together with fingers until right consistency. 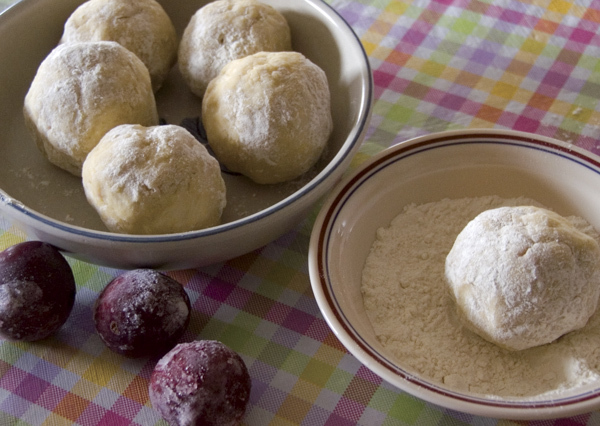 Wrap dough around plums and seal. Place in boiling water. Boil 30 minutes. Before serving, cut in half and remove pit. Sprinkle with sugar. Drizzle with melted butter. Serve warm. can you tell me what issue this story ran in? Karen, these stories appeared in the November/December 2008 issue of South Dakota Magazine.